Walnut-shaped cookies are among other traditional Christmas cookies in Slovakia. I’ve had them so many times before but never actually knew how to make them. During my last visit back home over Christmas holidays, one of our family friends had them when I came over for a visit and just couldn’t stop eating them, as they brought me back to my childhood. Obviously, I had to ask them for recipe that they’ve been using for over two decades, if not more. I haven’t tried making them until now. I didn’t have the proper molds, without which I didn’t think they would be the same. I know, silly me! I finally made myself to do some research. I had about $150 worth of Amazon credit cards, so I decided to go on a shopping spree. I first found this stunning pan with pumpkin, pine cone, acorn and walnut molds but when I got it, I realized that the molds were twice the size what I was hoping for. I was looking for more of a bite-sized cookie molds, or to have something closer to what a real walnut size is. I went back to searching and to my own surprise, I was actually able to find the traditional walnut-shaped cookie molds. The lazy part of me, didn’t feel like dealing with all the individual molds and having to grease and flour them, so I looked further and found a non-stick walnut mold pan, and ended up buying 2 of them. Now, let’s get to the good stuff – our recipe. Mix all cookie ingredients together, until butter well incorporated and you form a very thick and dense dough. Let it chill in fridge up to an hour. 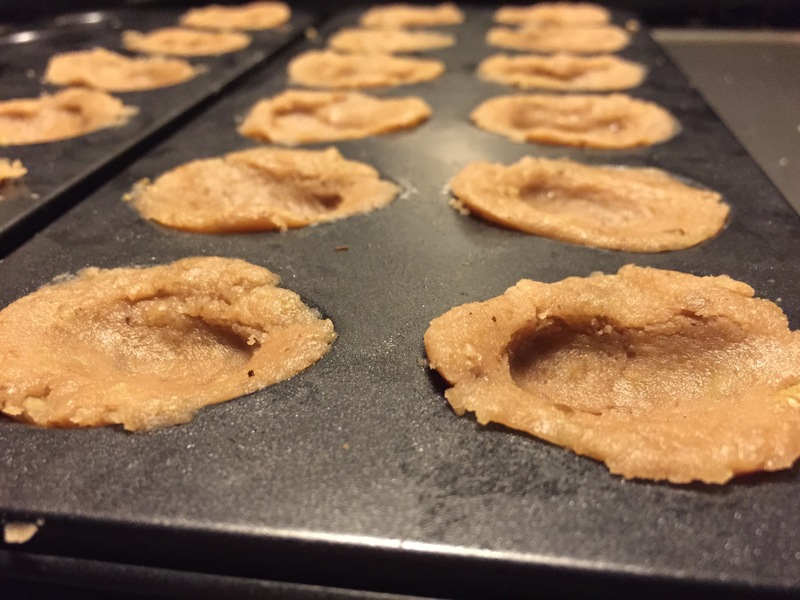 Grease and flour your walnut-shaped cookie molds. Fill and press in with your fingers a little bit of dough into each mold while leaving a little dent in a middle for your filling later. No need to put dough all the way to the top, as it will rise a bit during baking. Bake slowly at 350 F for about 20 minutes. 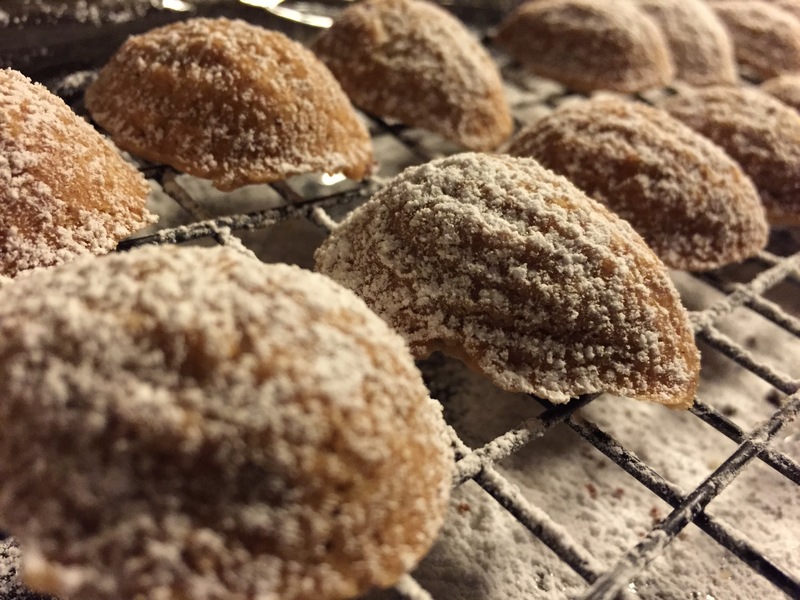 Get cookies out of mold and let it cool on a cookie rack, before dusting it with powdered sugar. To make your filling, continuously stir eggs with powdered sugar in a double boiler, until the mixture thickens. Once cooled, mix it into already beaten, until fluffy, butter. Bind two cookies at a time with your filling and store in fridge in a air-tight container. Instead of greasing and flouring my molds, I sprayed a little bit of a baking spray that contains flour on my brush and brushed them out . Because my pan is non-stick, I only had to do it once and didn't have to do it after that. What worked the best for me to get cookies out of the mold, I turned over the pan on a small angle and gently tapped it against a surface. If they don't come out all at once, tap it again, just make sure not to hit the ones that have fallen out already, as you risk smashing them. When cookies come out of oven, they are very flaky and prone to breaking but once they cool, they become very hard. Once you bind two together with filling and store them in a air-tight container, they soften up over time. When it comes to filling, because my recipe contains butter and eggs, it's recommended to store it in fridge, or somewhere cold. Take cookies out maybe an hour or two before serving, so they have a chance to get more at a room temperature. You can also opt for different filling, like one that uses vanilla pudding instead of eggs or use your favorite jam. If you choose to dust your cookies with some sugar (I mix powdered sugar with some vanilla sugar for more fragrance), wait for them to be warm. If they are too hot, sugar will melt and that's not what you want.